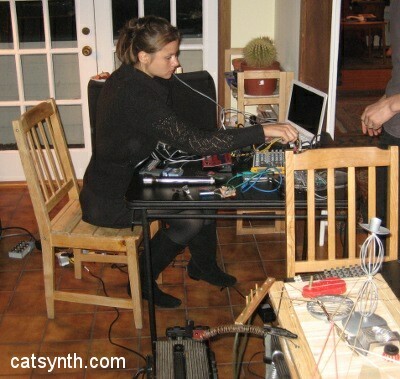 “Tuesday at Tom’s” is a series of performances in a private home in Berkeley. This past Tuesday I had the opportunity to perform along with other small groups whose performances all took advantage of this informal and intimate setting. Polly Moller and I performed the “Ode to Steengo.” The piece was originally inspired by spam texts that were forward to the Bay Area New Music list that seemed to describe the adventures of a musician named Steengo – “he is a percussionist and plays a molecular synthesizer.” The texts include a mixture of dialog about a band performing together, and sci-fi and surreal images. 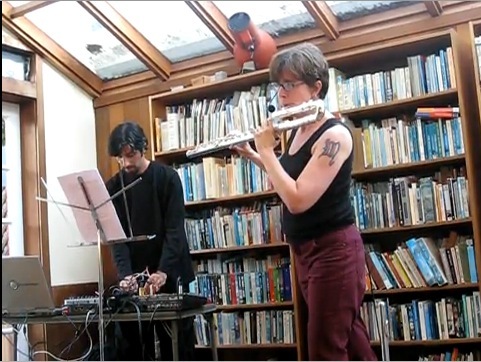 The performance included live electronic processing of spoken word as well as flute, bells and heatsinks. In addition to looping and effects, I also used a Korg Kaos pad, which has become one of my most reliable live-performance tools, to represent the “molecular synthesizer” as well as other interpretations of phrases in the text. 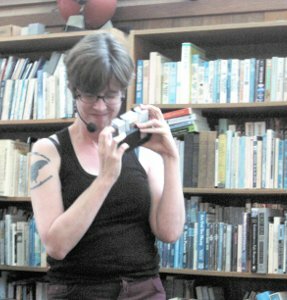 The performance was well received , and I did get to hear part of it in videos. The balance and interplay between the synthesizer notes, spoken word, and instruments was very tight – once again practicing does pay off. 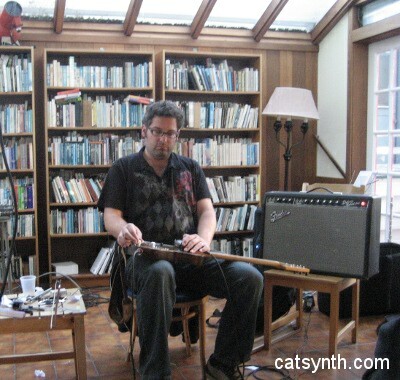 We were preceded on the program by New York-based guitarist and sound artist Terrence McManus. Although his performance centered around the guitar, the instrument served as part of a system for generating abstract sounds with electrical and electronic effects. Musically, the sound ranged from quite noisy to very harmonic and serene, often with gradual shifts. There were sections where McManus did pick up the guitar and play it like a traditional guitar, with delays and other effects; he also at one point used a cell phone in conjunction with the guitar. Musically, the combination was an intense mixture of sound objects and textures, with lots of strikes and crackles, rich metalic sounds, static and synthesizer noise, and toy sounds. 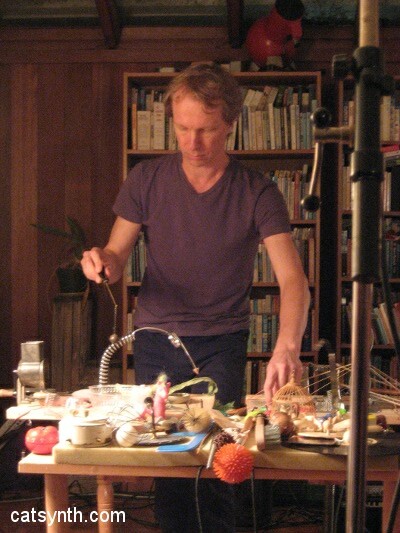 I mostly focused on Bergmark’s performance and his motions with the various toys and appliances and metal constructions. 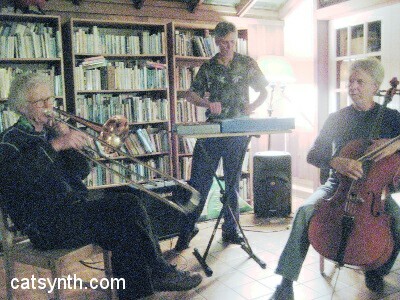 The final set was the trio RTD3, consisting of Ron Heglin, Tom Nunn and Doug Carrol performing free improvisation. 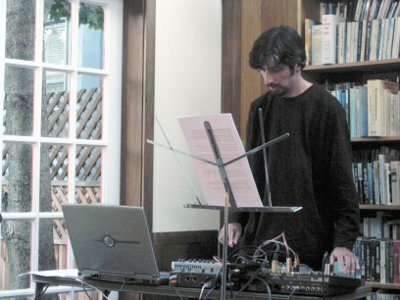 I found myself focusing quite a a bit on Nunn’s custom electronic instruments, two of which looked like boxes with interesting controls on top, and the third was a series of live metal rods that could be struck or bowed; and Carrol’s rather unusual and theatrical positioning of his cello in some sections. Although there was an electronic component, the music itself sounded “acoustic”, as it was dominated by cello, and Heglin’s trombone (and occasional vocal) performance.